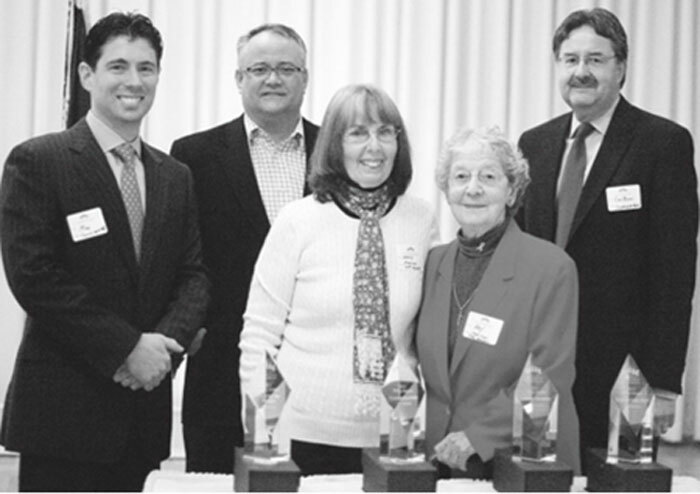 (Left to Right) Business Pillar Award Winners Max Puyanic of ConvenientMD, Jim Desjardins of Daisy Cleaners, Phylis Machulatis and Kay Pancioclo of Food for the Hungry, and Carl Berni of Canobie Lake Park. Governor Maggie Hassan speaks to business and community members last week about the New Hampshire economy and her plans to help the state prosper in the future. “We cannot sit back waiting for an innovative economy,” Governor Maggie Hassan told local business leaders last week about her goals for the New Hampshire economy. Part of the Greater Salem Chamber of Commerce Economic Development Breakfast, Hassan said her budget helps to build the economy, fund education by reducing secondary education costs, and support innovative companies. Rising tuition rates can make in state college costs more expensive then out of state tuition in Massachusetts, Hassan said. “Our budget brings our university system back to 90 percent of where it was before the cuts.” Hassan said she plans to freeze tuition rates for the next two years. Innovative companies are another part of the Governor’s plan. “We need to lay the groundwork and provide the support for innovative companies.” A research and development tax credit will help businesses invest in new technology, Hassan said. She also added funding into her budget for a statewide economic development director. Hassan hopes that increased tourism will help the state economy. She said repairing a failing infrastructure will help attract tourists, allow for easier travel into the state. “They need us to finish I-93 to move forward,” she said, adding hundreds of red listed bridges are increasing safety concerns. Hassan said New Hampshire motorists spend about $267 million annually in extra vehicle maintenance. Bridge closures into Maine are also a concern. “We have for the second time, only one functional bridge crossing the Piscataqua River for traffic into and out of Maine.” An accident on the river where a ship collided with the bridge last month closed the Sarah Long bridge, which remains under repair. Portsmouth Memorial Bridge is bring replaced and not expected to open until summer. Hassain said if the bridge caused delays in river traffic, a significant spike in every costs could have been seen. Hassan also advocated for support of mental health patients. She said 10 to 15 children wait in emergency rooms daily to receive treatment for mental disorders. “It’s beyond time that we make real and meaningful investments,” she said. Expanded gaming will help boost the economy. “We can no longer pretend that expanded gaming isn’t coming to our communities”, she said. Gaming in Massachusetts will cost the state over $75 million in social costs and lost revenue from rooms and meals tax, Hassan added. The Governor added $80 million into her proposed budget to be raised by expanded gaming. “I believe the approach we have take puts our state on the right path,” she said. Also at the breakfast, the annual Business Pillar Awards were given out to area businesses that are successful in their industry and a pillar to the community. Food for the Hungry received the Not-For-Profit award, ConvenientMD received the New Business award, Daisy Cleaner was the Small Business winner, and Canobie Large received the Large Business award. Interim Director Christopher Way of the Division Economic Development for the State of New Hampshire also spoke about the state’s economy.